George Augustus Murtagh was born April 8, 1904 in Jersey City. Nicknamed Mickey as a boy, he excelled in a number of sports, including baseball and football. He attended St. Peter’s Prep, where he starred for the Marauders as a baseball catcher and football end in the early 1920s. Mickey was a six-footer with great quickness and agility. He could play any position on the field, but was best as an undersized lineman. In 1922, Mickey was admitted to Georgetown University and made the varsity a year later. Mickey was part of a squad that included Jack Hagerty, Claude Grigsby and Babe Connaughton, Mickey’s hulking linemate—three of the top players in the region. Lou Metzger, Ching Hammill, Fred Sheehan and Gene and Tom Golsen were also key players. 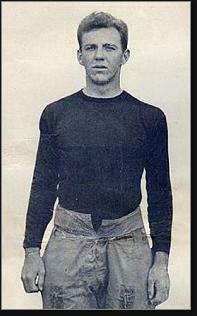 In 1924, Lou Little became the Hoyas’ coach. He tightened up the defense and in 8 games the team gave up a mere 39 points. Mickey, a junior, was a crucial player on both sides of the line. Unfortunately, the offense lacked scoring punch and Georgetown finished the year a lackluster 4–4. The story was different in 1925. The Hoyas blew out Drexel, Detroit and Lehigh by a combined score of 89–0. These were not national powers, so Georgetown’s November game against undefeated Fordham at the Polo Grounds in New York was seen as the true test of their talent. The Rams had surrendered a mere 12 points t that time and were heavy favorites. Mickey and his teammates shocked the crowd with a 27–0 victory. Georgetown’s only loss in 10 games during 1925 was to Bucknell, by a score of 3–2, in a rain-soaked defensive battle. After graduation, Mickey decided to give pro ball a try. The NFL had expanded east in 1925, establishing a team in New York owned by Tim Mara, a wealthy sportsman (aka professional gambler). Mickey and Jack Hagerty tried out for the Giants in 1926 at their Pennsylvania training camp and made the club. The two had become great friends by this point; not only had they starred for the Hoya gridders, but Mickey caught for the baseball team and Hagerty was the center fielder. The Giants went 8–4–1 and finished 6th in the league in Mickey's rookie season. In 1927, Cal Hubbard joined the line and New York held opponents scoreless in 10 of their 13 games, finishing 11–1–1 to take the NFL crown. Were it not for a loss and a scoreless tie to the Cleveland Bulldogs, the Giants would have had a flawless season. After a disappointing season in 1928—during which Mickey missed several games with a broken hand—Mara fired almost his entire club and rebuilt around Mickey, Jack Hagerty, future coach Steve Owen, Hap Moran, Mule Wilson and Olympic decathlete Tony Plansky. Mara did so by purchasing the entire roster of the Detroit Wolverines in order to get quarterback Benny Friedman, whos forward passing was about to revolutionize the pro game. During training camp in Asbury Park, Friedman seized control of the team, becoming the de facto coach, and got the veterans and dozen-plus rookies on the roster to buy in to his vision of what an NFL offense should be. The results were immediate and impressive. In 1929 and again in 1930, the Giants led the NFL with 13 victories, but the rules of the times gave the title to the Green Bay Packers, the team with the best winning percentage. Mickey manned the center position on offense and played defensive end and tackle. He was considered one of the finest all-around interior linemen in the game despite his size. At 6’1” 190 pounds, he was the smallest of the New York linemen for most of his pro career. He occasionally played in the backfield as a blocking back. In 1929, Mickey scored his one and only NFL touchdown against the Frankford Yellowjackets on a pass from Moran. In 1932, Mickey was injured in the season's third game. Rookie Mel Hein replaced him at center and never relinquished the starting job. Mickey decided to retire prior to the 1933 season. After his NFL days, Mickey got into coaching. He joined Jack Hagerty's staff at Georgetown and was in effect the team's defensive coordinator. Between 1938 and 1940, the Hoyas went on a 23-game unbeaten streak. Mickey also coached the school's baseball team. In 1948, Georgetown voted to scale down its football program and Mickey became head of the intramural sports program (where tackle football was still offered). In the early 1960s, enthusiasm began building to restart varsity football and a couple of years later this vision was realized, much to Mickey's satisfaction. In 1964, Mickey's name came up for voting in the Pro Football Hall of Fame. He didn't make it, and he faded from memory in the decades that followed. He passed away in 1993.